This is an Open Access article. You will receive access to the full text. This paper investigates the intergenerational welfare impact of raising administered retail energy prices in Saudi Arabia, an example of an oil-exporting country with a fast growing population. To achieve this, we develop a dynamic model with overlapping generations (called MEGIR-SA), which we believe is the first empirical application of its type to be developed for an oil-exporting country. The model is used to analyze the effects of the increase in some Saudi administered energy prices implemented at the end of December 2015. In particular, the model analyzes how these price increases might affect the welfare of Saudis through a direct increase in energy expenditures, an indirect rise in Saudi public income stemming from a lower domestic demand for oil that fosters oil exports at a given level of domestic oil production, and a direct increase of the turnover of the energy sector. The two latter effects can be redistributed by the Saudi public authorities to private agents through higher current public spending and/or public investment. The analysis suggests that the increase in end-user energy prices results in a net overall favorable effect on the intertemporal welfare of all households. This mirrors the impact on the income of private agents of the surplus in public oil income associated with lower domestic consumption of oil products and recycled to private agents. Moreover, it is shown that the additional oil income associated with the increase in domestic energy prices tends to be relatively more beneficial to future generations if it is recycled through public investment. This is reinforced if the future price of oil remains relatively low. In a possible future situation of declining oil prices and domestic production, a policy that would help meet the Saudi Arabian objectives may consist of gradually increasing the fraction of the additional oil income that is recycled through public capital spending. References: Reference information is available for this article. Join IAEE, log in, or purchase the article to view reference data. 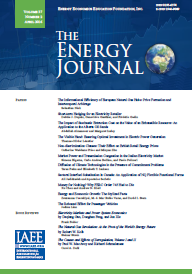 Published in Volume 40, Number 3 of The Quarterly Journal of the IAEE's Energy Economics Education Foundation.